Draw the attention of the Brotherhood. Rumors abound that the Dark Brotherhood, assassins of legend, are on the lookout for members worthy to wield their killing blade. This might be why so many innocents have been murdered of late. Meet Amelie Crowe at any Outlaws Refuge, or receive quest through the Collections tab. Speak to the messenger and head to the Anvil Lighthouse. Talk to Amelie Crowe at any Outlaws Refuge to start the quest. "This place is nice, but it's not a home. It feels like I'm hiding down here. People like us, we need powerful friends if we're going to make it in this world." "Don't play coy. I see it in your eyes. You've killed people. Or you will. You've got the same urges as I do. Just between us, I hear the Dark Brotherhood is recruiting for some new blood. I'm going to try my best to get their attention." "You never heard of Tamriel's most elite guild of assassins? Rumor has it that if you take an innocent life and they notice, they'll offer you a place in the Dark Brotherhood. There, killers are free to pursue their true passion. If you start the quest through the Collections tab you need to travel to Anvil first and talk to Amelie Crowe there. "Is it time? Has the Dark Brotherhood finally noticed my impeccable work? I'm ready, dark one! I swear, in the name of—wait, I should let you talk first." "Nothing. Nevermind. I thought you were someone else, that's all. Forget I said anything. It's just ... there's something about your eyes. They have a certain look about them. I thought you were ... well, I thought you were one of them." One of them? You thought I was one of the Dark Brotherhood, didn't you? "Keep your voice down! But yes, I thought you were with the Brotherhood. You've got that look in your eyes. You killed people. Or you will. Just between us, I heard the Brotherhood seeks new recruits. I plan to be one of those lucky few." How do you plan to get the attention of a secret group of assassins? "Rumor has it that if you take an innocent life and the Dark Brotherhood notices, they'll offer you a place in their guild. Think about it. A place where killers are free to pursue their darkest passions. Doesn't it just give you the chills?" I don't know. It sounds kind of risky. Travel to Anvil if you're not already there. Find an isolated civilian and murder them. Search for Amelie Crowe near the docks in Anvil. She has disappeared but a courier will call out to you. Talk to him and you will receive a Mysterious Letter. "Pardon the interruption. I've been looking for you." "Not me, but I have something for you. A letter. Confidential. Private. I have it here somewhere. Yes, here it is! Interesting. I'm also supposed to extend a verbal invitation to visit the lighthouse. Odd that they didn't just put that in the letter." "Yes, the Anvil Lighthouse. Just up the way. The sender ordered me to direct you there after I handed over the letter. I'm glad I found you. After looking for the other woman with the eye-patch all day, I figured I was in for a late night." The woman with the eye-patch? "Amelie Crowe? Do you know her? I gave her a letter, right there on the Anvil docks. I have no idea where she went in such a hurry, but she seemed excited to receive it. Anyway, I have more deliveries to make before I can rest for the day. Farewell!" The note is the Black Hand, the sign that the Brotherhood has noticed your activities. Make your way to the Anvil lighthouse and enter. Talk to Speaker Terenus to complete the quest. "Come closer and let me look into your eyes. No remorse, no mercy. Yes, you do have the eyes of a killer. How many lives ended looking into those eyes? Enough that the Night Mother has noticed, obviously. Which brings us both to this place and time." "I am a Speaker for the Dark Brotherhood. I speak with the voice of the Night Mother. I act with the hands of our Dread Father, Sithis. I have an offer to make to one so skilled in the art of murder. An invitation, if you will." "Nothing to say? I can appreciate that. I am a Speaker for the Dark Brotherhood. I speak with the voice of the Night Mother. We have been watching you. You can deal death, but you lack purpose. We can change that ... if you are willing." "As well you should. I am certain you have questions, but first we must determine if you are worthy of joining the Dark Brotherhood. You take lives easily and without hesitation. We know that you can kill. Now show us that you can also obey." You're wrong. I'm no murderer. "No? What do you call it? Self-defense? Justice? Did they all deserve to die? How you justify your actions does not matter. All souls belong to Sithis in the Void. We are simply the instruments of their delivery." "Of course not, but we'll have time for clarity later. First we need to determine if you are worthy to join the Dark Brotherhood. You take lives easily enough, so we know that you can kill. Now show us that you can also obey." "Silence is the music of Sithis, so perhaps you will serve us well. But first we need to determine if you are worthy to join the Dark Brotherhood. You take lives easily enough and we know that you can kill. Now show us that you can also obey." "Splendid! We shall see how well you marry business with death. But first, allow me to present you with a gift. I shall teach you how to call upon a particular tool of our trade." "A tool for dealing death, of course. One forged by unseen hands. The Blade of Woe. Wield it from the shadows and its edge shall deliver your prey to Sithis in the Void. "I grant you access to the Blade of Woe. Sharper than any other dagger you have at your disposal, it shall be your weapon just as silence is your armor. Wield the blade from the shadows and let its edge send your prey to Sithis." "In return, I expect only unwavering loyalty and ruthless efficiency. Now, let us discuss the task before you. A killing that shall form a covenant between us, signed in blood." If you accept the quest from the Collections tab you will be directed to travel to Anvil first and then talk to Amelie. She will have different dialogue in this case. Word around town suggests that the Dark Brotherhood is seeking recruits in Anvil, a city on the Gold Coast. I should travel to Anvil and see if the rumors hold any truth. 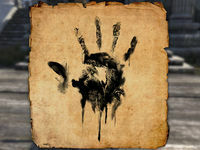 It seems that the best way to get the attention of the Dark Brotherhood is to kill an innocent person in cold blood. If I'm going to do this, I should go to Anvil on the Gold Coast and see if they think I'm worthy to join them. I murdered an innocent in Anvil, just as Amelie suggested, but other than the spilled blood and having a sense of being watched, nothing happened. Maybe Amelie has an idea about what I should do next. She said I could find her near the Anvil docks. I couldn't find Amelie, but a courier approached me. I should see what the courier wants. I received a mysterious letter and an invitation to visit the lighthouse south of Anvil. I should go and find out if this has anything to do with the Dark Brotherhood. There's someone waiting for me inside the Anvil Lighthouse. I should talk to him. Finishes quest I should talk to Speaker Terenus and find out more about why I was invited to come here. This page was last modified on 3 February 2019, at 23:43.